Please complete the brief form below to help us better serve your request. A member of our team will be in contact with you shortly. Creating a brochure and tradeshow display to represent multiple partners equally exciting was no small task, but the design team met the challenge beautifully." It made me exteremely proud to have such beautiful invitations designed on my behalf. Kudos to the design team, they were the most beautiful invitations I have ever seen." Each year the design team reports our success in a visually compelling way. We are extremely happy with the collaborative process and plan to continue working with them!" 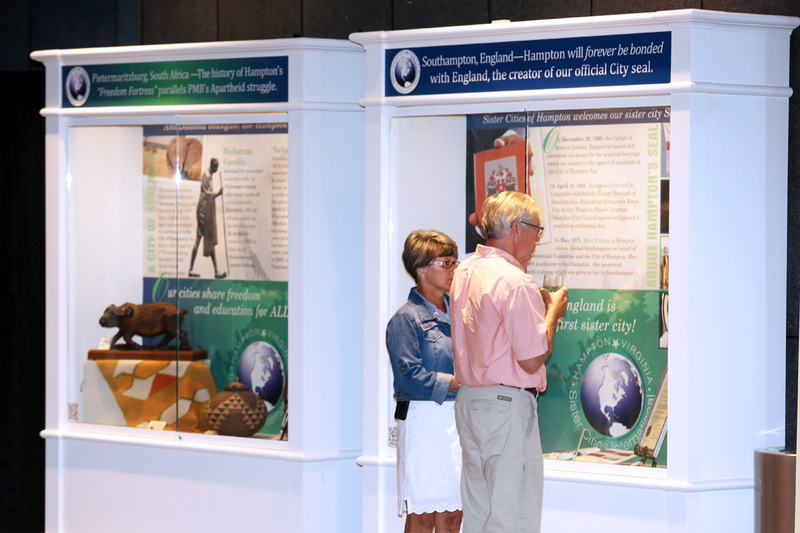 In an effort to educate local citizens, visitors and delegations on the impact of their program, Sister Cities of Hampton partnered with us to create permanent displays highlighting their four Sister Cities. We worked with the 14-member board to develop the message, timeline, design, and coordinate the production and installation. Each case has a welcome in the country’s native language and contains milestones and artifacts that show the impact of their relationships. View them at the Hampton Roads Convention Center. © 2018 A Graphics Experience. All rights reserved.